Thank you for a comprehensive and timely article on an important subject. A palliative approach to care is so necessary in a healthcare system that often focuses more on cure that care. For persons living with chronic, debilitating and/or life-threatening illnesses, a palliative approach to nursing care recognizes the uncertainty and anticipatory grief experienced by patients and families. Acceptance of such an approach ought to support nurses as they advocate for patient’s needs, wishes and clarify goals of care. I elaborate further in the book, “The Moral Work of Nursing: Asking and living with the questions,” which integrates nurse’s experiences, nursing research and social history to inform, encourage and empower nurses in their moral work. I regret that it’s too late to reference this article in the second edition that was released in May. Part of our health care system is Long Term Care Homes. We have residents coming in much older, most have a dementia, and much further into their diagnosed diseases. Life expectancy is 18-24 months and getting shorter every year. Staff are recognizing this fact. Yes this is their home, saying this, they deserve the best palliative care given by educated staff. I am a strong advocate for education in P/C/EOL Care. One problem I am coming across is the use of the Palliative Performance Scale. This is a wonderful tool to use for our residents. Staff are having a hard time adjusting to its descriptions. Would you know if it can be made, or has been for LTC? Our residents deserve excellent palliative care, not just end of life care. 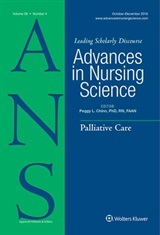 Jackie, we appreciate your comment/question as it illustrates two of the central issues we are addressing in this paper: how to particularize general knowledge to local contexts of everyday nursing practice and how to adapt palliative care practices to provide a palliative approach for various populations and nursing contexts. Your specific question relates to the use of the Palliative Performance Scale (PPS) with persons living in residential care, many of whom have a diagnosis of dementia as well as other comorbidities. Based on our experience and the experience of other members of the iPANEL team, we have found there are challenges using the PPS to help families and staff identify the illness progression and risk of dying for this population. Victoria Hospice (which developed the PPS) has helpful information about Palliative Care Planning for dementia (https://www.victoriahospice.org/sites/default/files/forget_me_not_sample.pdf ) which illustrates how tools such as the Functional Assessment Staging of Alzheimer’s Disease (FAST) and GLOBAL DETERIORATION SCALE (GDS) can be used to understand the overall course of the illness. The Quality Palliative Care in Long Term Care Alliance (QPC-LTC) has worked with the PPS in residential care and Sharon Kaasalainen (http://nursing.mcmaster.ca/faculty/bio/sharon-kaasalainen) is a resource for this work. Work has also been done combining the PPS with the clinical frailty scale: http://www.virtualhospice.ca/Assets/CFSPPS%20Poster%20FORMAT%20APR18_20151120154653.pdf and https://www.ncbi.nlm.nih.gov/m/pubmed/24962427/. In practice contexts which use the interRAI, combining the CHESS score with frailty scales may be helpful: http://www.interrai.org/assets/files/Scales/CHESS%20Scale.pdf . The above examples of how the PPS may need to be adapted or combined with other tools illustrate the current interest in adapting palliative care practices to serve the residential care population better. iPANEL( http://www.ipanel.ca/) has recently prepared a video and infographics which you may fine helpful; they describe the shift in thinking required for nursing staff in different settings, including residential care, to adopt a palliative approach.